Damn Yak Dry Goods Co.: Grey Jay, Canada Jay, or Whiskey Jack. One of our followers looking for food. While in Algonquin Park last weekend, we were inundated with swooping Whiskey Jacks looking for hand-outs. While my Wife succumbed to it once, I was surprised that on every hike we went on they would follow us for kilometers, flying from tree to tree watching us ever so closely. These are beautiful, fairly big birds. I'm not talking Raven here, but way bigger than the chickadee I am use to having eat out of my hand. This friendly bird has been known as many things, in Latin - Perisoreus canadensis, English - Canada Jay, Grey Jay, Butcher's boy, Meat Bird, Camp Robber. Moose Bird, and Finally my favorite - Whiskey Jack. its this name that interests me, because I can understand the other names. 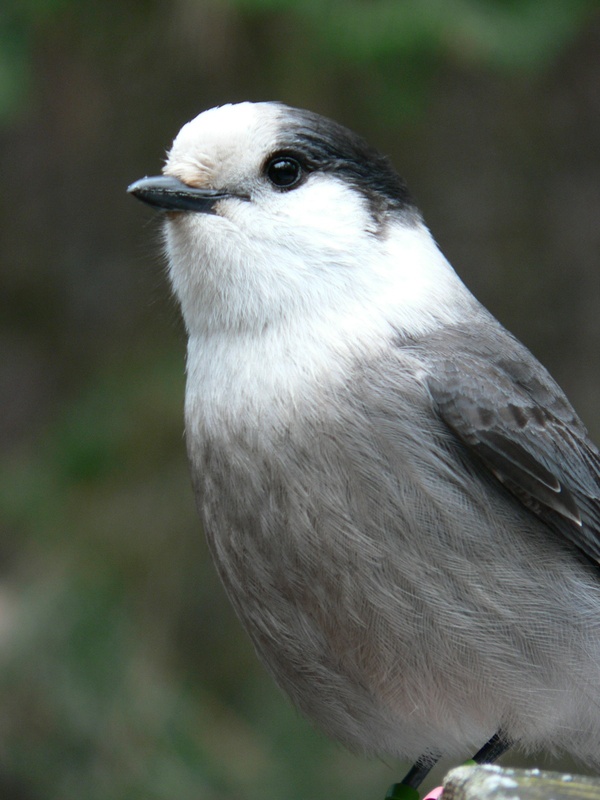 Average names that have to do with something what the Grey Jays do, whether is land on moose or steal your food. In doing some research I found in Katherine Barber's 2007 book "Only in Canada", it suggests that Whiskey Jack comes from the Cree word for blacksmith, "wiskatjan." The bird's colour supposedly made people think of ashes and soot. Hudson's Bay Company workers in the 18th century, who heard the Cree word as "whiskeyjohn," then altered John to the more informal Jack. Please take a look at this quote from a Metis-Cree discription of Wisakecahk, the boreal trickster. "Wisakecahk is one of the most famous Cree heroes. There are hundreds of endless stories about him. He is a joker, always playing jokes on his brothers and sisters, the animals, plants and rocks. Stories about Wisakecahk always have a moral. They are called story cycles because they are all connected. Each story is from the collective memory of everyone who has told it and may change each time it is told. The narrator may add characters from another story or change the story slightly to make a certain point. Wisakecahk has many powers, such as the ability to change shape and be anything he wants, and to speak the languages of the animals and plants. No one really knows what he looks like. He is believed to have left the earth and to have headed north, but he returns sometimes to attend dances and other celebrations. However, his presence is never mentioned at these functions. The mischievous Wisakecahk is always getting into trouble in his attempts to prove his intelligence and strength. Stories about Wisakecahk usually begin with him walking and feeling hungry. He is too lazy to get food for himself, so he will try to trick other animals into giving him their food, or into becoming his food. Tricks are often played on Wisakecahk himself. The stories also tell of Wisakecahk's entrance into the world and his experiences, teaching us about how animals and plants came to have their present colours, forms and special characteristics. Stories about Wisakecahk are to be told only in the winter. If they are told during the summer, when there is good weather and we should be working as much as possible, the lizards will ruin the narrator's life by sucking his or her blood. These stories are meant to be narrated and not read; much is lost in the written word. Much of the spirit, humour and excitement are also lost in the translation of these stories; they can be best appreciated in the language in which they were first told. Wisakecahk is regarded as a pseudo-religious character in the Cree culture. His actions may seem evil or bad, according to Christian standards, but the Cree don't consider him or his actions evil. Christian morality is imposed in this situation. To the Cree, the means is less important than the end. Stories about Wisakecahk were told for entertainment and as a way teaching people how not to do things." 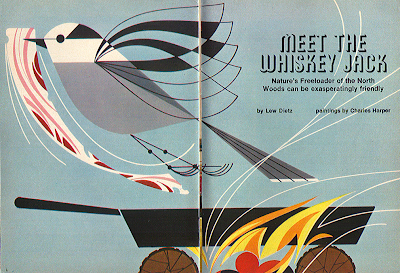 love everything about this, superb Cree story, beautiful illustration, such a charismatic bird!